application forms available from 01-December-2017. Last date for NMC online application forms is 15th December-2017. Application fee for general/ OBC candidates is Rs. 500/- and for SC/ ST candidates is Rs. 300/-. Candidates will be selected for NMC Teacher Jobs is based on written examination/ Interview. 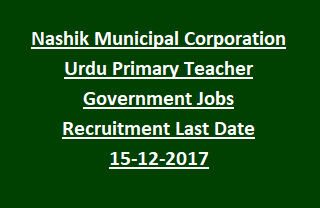 Qualified/ talented candidates may apply for Nashik Municipal Corporation 34 Urdu Primary Teacher Jobs before last date through offline. Further details regarding Nashik Municipal Corporation Recruitment 34 Urdu Primary Teacher Govt vacancies important dates, application fee details, Application procedure, Selection procedure, age limit details are stated below. Total vacancies available in Nashik Municipal Corporation NMC Recruitment are given below. Post Name: Urdu Primary Teacher: 34 posts. Visit NMC notification for category wise vacancy details. Please check the NMC notification for Pay Scale details. Applicants must have qualified HSC Examination with 50% marks and Diploma in Teacher Education (D.T. Ed). For more Qualification details see the Advertisement. Candidate should have upper age limit is 38 years. For age relaxation details please visit NMC notification. Candidates will be selected for NMC Recruitment Teacher Jobs is based on written exam/ Interview. See the NMC Notification for more selection process details. Interested/ qualified candidates may go through NMC official website www.nashikcorporation.in and read the instructions. Read the notification clearly and fill the application. Application form submission through offline mode starts from 01-12-2017. Last date to send NMC application form is 15th December-2017. See the notification for address details.